“I went to a few banks and Park Bank really stuck out and believed in me,” Chantel Turk. “We couldn’t have done it without them,” Randy Breidel. “To meet a banker that was straight forward and honest, we were impressed,” Holly Cichacki. “We’ve been working with Park Bank for a number of years,” Karen McCathie. "I am the owner of Shoot the Duck, Inc., parent company to La Crosse Archery and Sparta Archery. We had a very real challenge for growth and needed funding that our current lending institution was unwilling to provide. David and Park Bank came to the rescue with a SBA loan that has helped us grow the business and become the dominant player in Western Wisconsin. "Last year David came to us and said, 'I really think that you should buy that building that you’re leasing', which we hadn’t even considered. It turned out to be the right decision and David was there to help with that, too. Professionally, I have the belief that he truly cares about our business. He asks the right questions and pays attention to what we are doing. I’ve made recommendations to others and will continue to do so." "We went to Park Bank with our business plan, looking for a loan to start our medical supply business. We had tried other banks, including the one we had our home mortgage through, and none of them were interested in working with us. By the time we came to Park Bank we weren't feeling too optimistic. But to our surprise, Mark Schneider and Doug Farmer at Park Bank were willing to talk to us about our business plan, learn more about what the medical supply business is all about, and took a chance on us. Not only were they willing to give us a small business loan to start Family Medical Supply and CPAP Store, but when it came time to find the right location to house our store, they offered space to lease in a commercial building they own. They could not have been more helpful. We've been in business over a year and half now, and we know a big part of our success came from the support we received from Park Bank. Needless to say, that we now have our home mortgage through them too!" "Park Bank listened when we needed help and financial guidance. When we started the business we had a different lender who did not understand our business. We presented our portfolio to Park Bank in Sparta. 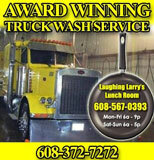 Within a few weeks we were well on our way to growing Award Winning Truck Wash to be a recognized business by companies up and down the interstate. "We highly recommend Park Bank along with the SBA loan program." Copyright © Park Bank, Holmen, WI All Rights Reserved.